Excavations were recently undertaken at Moat Lane in Towcester on behalf of Morgan Sindall Ltd and South Northamptonshire Council in advance of redevelopment. 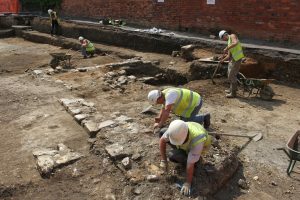 The works were a rare and exciting opportunity to examine the archaeology surrounding the historic market town. 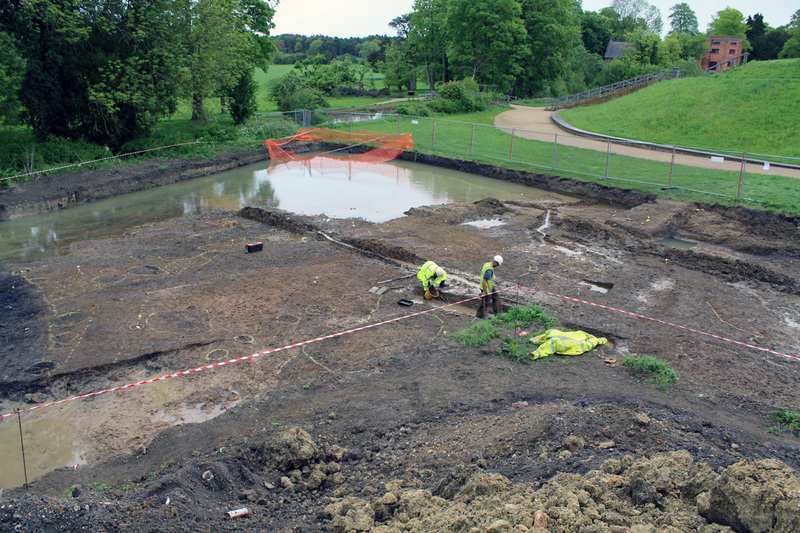 Work began in late April and will conclude in late July, and living up to expectations, the excavations, which are in the area surrounding Bury Mount, identified the location of the Roman defences and clarified the nature of Roman settlement in this part of the town. The present town straddles an important junction on Watling Street, the impressive Roman road which connects Dover, London and Wroxeter, a town on the Welsh borders. During the Roman period, the town of Lactodurum was established at the junction and rapidly grew into a successful settlement. It was the eastern edge of this settlement which formed the focus of our excavation. 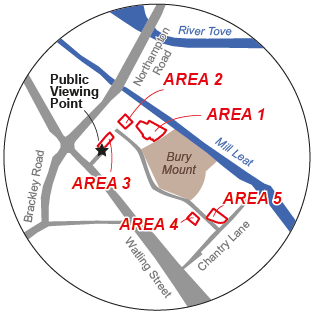 Area 1 is located near the base of Bury Mount (well outside the Scheduled Monument) and very close to the mill leat. The area is very waterlogged and slopes quickly away to the historic floodplains that surround the River Tove. Although no Roman buildings were found here, archaeologists uncovered some fascinating clues about the use of this area. A series of pits, postholes and enclosures indicate that this area may have been used to hold livestock. A variety of animals will have been kept by the residents of the Roman town and this area may well have provided shelter for sheep and goats as well as larger animals such as horses. 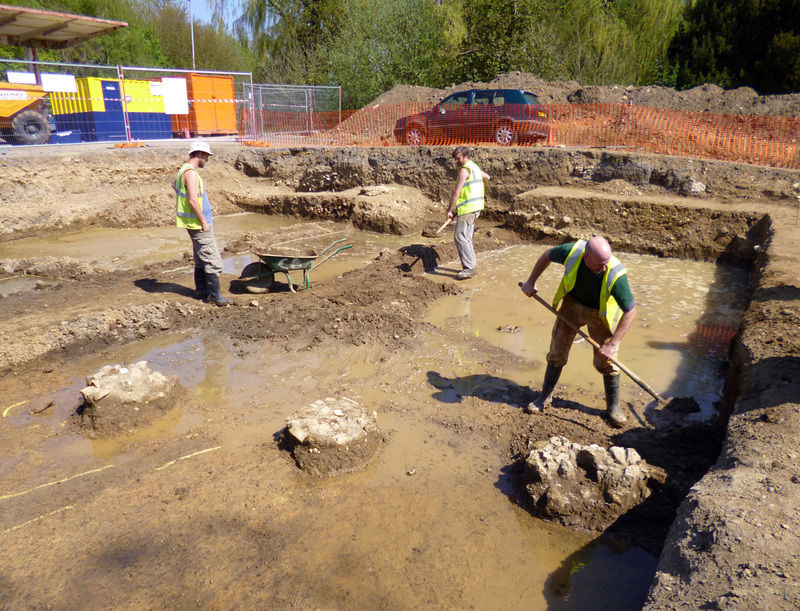 Excitingly, our team of archaeologists also uncovered evidence for the Roman ditch which surrounded the town and formed part of the defences. This ditch appears to have been reused, first by the nearby Norman Motte, then by defenders during the English Civil War and latterly during the construction of the mill leat. Archaeologists excavating the series of post holes and ditches in Area 1. The portion under water marks the location of the vast defensive ditch. Area 2 is located to the north-west of Area 1 and on slightly higher ground. Although smaller, this area revealed the first evidence of a Roman building. A series of post pads, stone bases used to support wooden posts, indicate that a large timber building stood here. It was probably used for storage or as a barn and adds weight to the evidence that this area was used for livestock management. 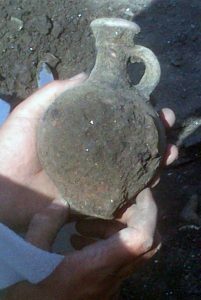 Interestingly, although there is a wealth of evidence for Roman occupation, very little remains of later periods. It appears that the land was cleared or scoured clean at some point during the medieval or post-medieval periods. It is likely that the soil was removed for construction purposes but we may never know whether it was used in the building of the vast earthworks of Bury Mount, or to form the base layer of the nearby Turnpike road. Area 3 is located near Whitton’s Lane and is the highest (and therefore driest) point of the site. 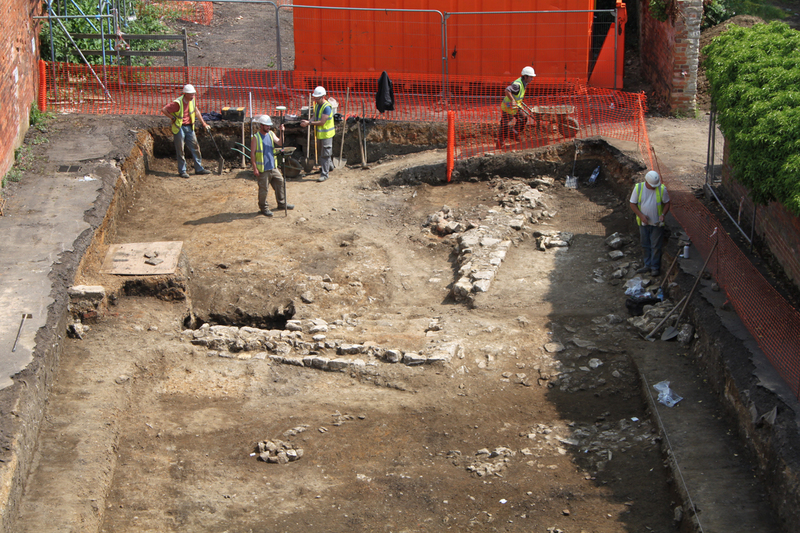 Excitingly, archaeologists uncovered the remains of a Roman building. The substantial stone footings indicate that this may have been a 2-storey dwelling. Its position between the core of the Roman town and the agricultural area uncovered within Areas 1 and 2 makes it likely that the occupants were undertaking some form of industry. 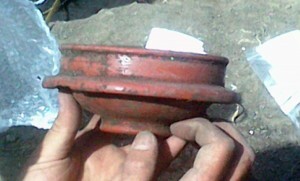 Archaeologists uncovered many fragments of pottery and animal bone. 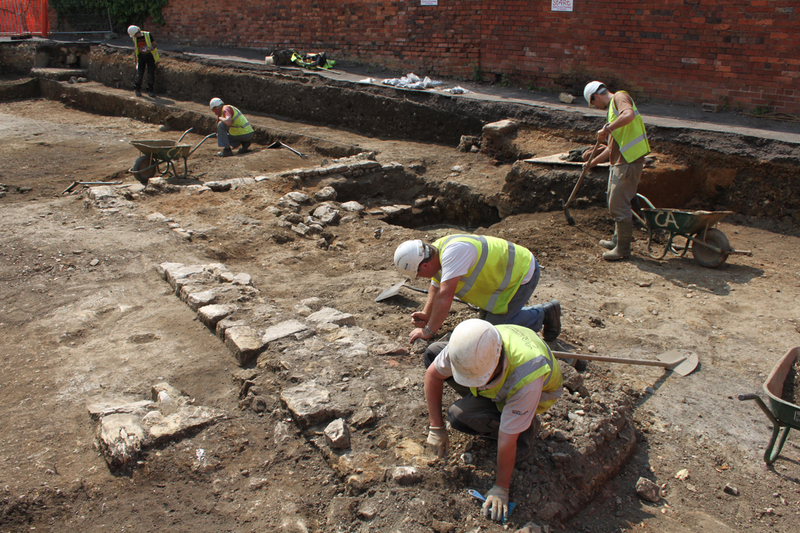 Impressively, our team of archaeologists also uncovered the surface of a Roman street which linked the building to Watling Street, the important Roman road which still runs through the centre of the present town. They also excavated what appears to be a basement or a cellar. Demolition rubble had filled this space and archaeologists hoped its removal would reveal remains that provide clues to the building’s former use. A viewing point was installed by this very exciting discovery and visitors were invited to come and see the building, and speak to the archaeologists as they made further discoveries. Areas 4 and 5 are located near Chantry Lane on opposite sides of Moat Lane. Area 4 yielded evidence of Roman activity which will help us to understand how the area was being used during the Roman period and how the town evolved. A Samian ware bowl and a flagon were discovered in this area. The excavation of Area 5 uncovered a series of medieval pits which were formed by quarrying for gravel. The pits have truncated the remains but they are still very useful for helping us to understand the kinds of medieval industry which were going on in this area. The main phase of archaeological excavation has now been completed and we move into off site assessment and analysis in preparation for publication of the results. It has turned out to be a remarkable site with the uncovering of the finest Roman building ever unearthed in Towcester, which has been preserved in situ under protective backfill. Keep up to date with developments as they happen on Facebook and Twitter.